TRB conducted PGTRB Exam every years. For the Physics subject the questions are asked in depth of the content. And it is very difficult ot get success in this Exam only hard work and well planned preparation may help to gain great success. 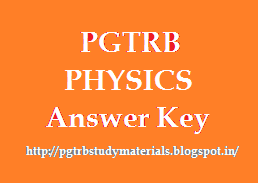 All the Physics PGTRB Exam preparing candidates must discuses about the previous year question papers. It will help them to know the method of questioning. To helping these PGTRB Exam preparing candidates . Our website uploaded the year wise question papers with Answer Keys. Let us PGTRB Physics see the below link.